Our annual Christmas meal is shared with our friends from Crowthorne Chess Club at the wonderful Don Beni Italian Restaurant in Crowthorne High Street. The Khyber Cup Rapidplay Tournament is an annual jolly event hosted at a members premise. 2019 sees a revisit to the premise of John Upham in Cove, Farnborough. 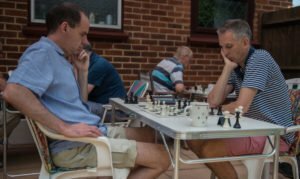 This is a one-day rapidplay tournament open to all members of Crowthorne & Camberley Chess Clubs. We play a couple of rounds and then adjourn to The Thatched Cottage for liquid and solid refreshment. We then stagger back to The Lodge for the remaining three rounds followed by the prize giving. Junior members are welcome if accompanied. 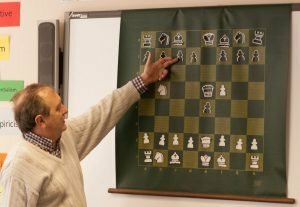 Experienced chess trainer and witty raconteur, Ken Coates, will chat about any aspect of chess.